What do all those people in photos holding fish have in common? Simple, they go fishing. That’s right, if you don’t go, you won’t catch anything except a bad case of envy. It is much easier and more fun to go fishing on Kiwi Angler. Anyway you look at it, the worst day fishing is better than the best day working. 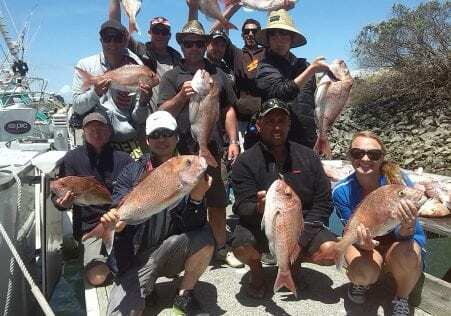 So get serious about having some fun and Snapper fishing in Auckland. Well just north of Auckland we are based at Gulf Harbour marina The gateway to auckland city. You get a great boat, designed and built to fish. A crew dedicated to making it happen. Some of the best fishing opportunities in the world. 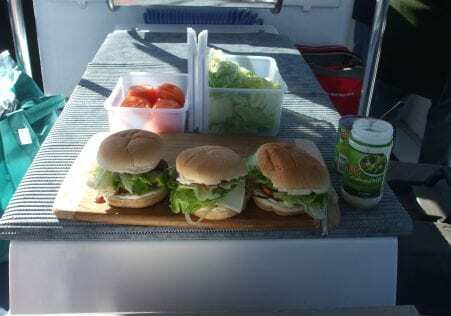 We even give you a barbecue sausage sandwich for lunch while you fish. Tea and coffee is free all day. You can decide where you want to fish or rely on the crews choice of the day. You can fish from Rangitoto to Kawau and Little Barrier, and all areas in between. Tiri Tiri Island, Flat, Horn, and Anchorite Rocks are just some of the potential hot spots available. e.g. Little Barrier approx. 90 mins and Flat Rock approx. 50 mins. We can supply all your tackle, bait, burley and food. Just let us know in advance what your group wants and we’ll make it happen. Ask for additional information on catering if required. White soled shoes, warm clothing, sun block, rain coat and your own nibbles are recommend. Bring a bag to take your fish home in. Just as you don’t, we do not have control over the weather, nor can we tell precisely what it will be doing tomorrow. Our experience is that the best solution is to make the decision on the day at the marina. In over 80% of the time, we can go. Cancellation is at the skippers professional discretion. KIWI ANGLER is a modem purpose built 12.8m (42′) charter fishing boat. Powered by a 450hp Scania diesel, KIWI ANGLER cruises upto 22kts (38 km/hr) fully loaded, getting to your chosen location quickly. Full walk around decks and extensive fishing cockpit make fishing for up to 20 efficient and relaxed. 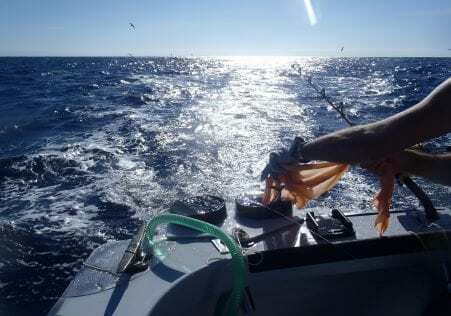 Modern fish finding and navigation equipment is used. Your safety is paramount so the boat is certified for up to 20 passengers and 17 for fishing, operating a comprehensive Safe Ship Management program.